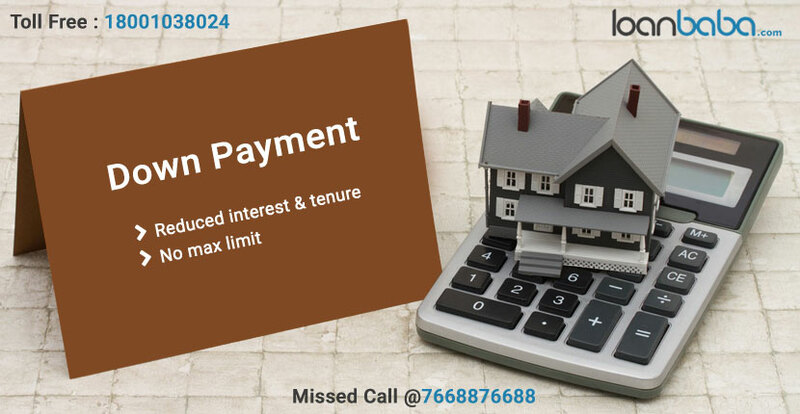 When you apply for a home loan in India, you need to pay a specific amount as EMI at regular intervals as repayment. Depending on the financial institution chosen, the loan amount limit will vary. There is a unique way on how you can reduce the loan amount needed and manage your finances. The way to go about in doing so is by making a down payment on the loan. Since, 100% finance cannot be secured for home loan, down payment is necessary, and this is why you must know about it when applying for the loan. What is Down Payment? Why Choose Down Payment on Home Loan? Housing loan down payment is a method where a certain percentage of total value of the asset is paid in one shot and the rest amount is distributed in EMIs. Today you can get best interest rates and offers on housing loan at loanbaba.com that lessens burden of repayment, so you do not have to worry. Example about Home Loan Down Payment: If the total value of your house is 40, 00,000 Lakhs you may be asked to pay 20% of its which comes to 8, 00,000 Lakhs and the rest amount of 32, 00,000 Lakhs is distributed in EMIs. In India, the prevalent value of down payment is 20% of property value. What do you get if you choose Down Payment Option for Your Home Loan? Reduced duration of EMI period- with the down payment option you can now reduce the loan tenure. So, instead of a 15-year loan payment you can have a reduced period to 10-12 years. Reduced rate of interest can help you save money because of down payment. There is no maximum limit to down payment and you can choose any amount of the total value to pay depending on your budget and limit. Note: Down payment does not include registration and other costs related like property tax. Hence, this will over and above your down payment amount. Why Do People Increasingly Apply for a Home Loan? Owning a house is one of the common aspirations that people possess. Living in a property one owns gives a certain advantage than staying in a rented place. The person can exercise complete control over the residence, if they own it, but when it comes to renting the same, they are bound by regulations meant for tenants. A house is one of the biggest aspirations any individual; dreams and aims to possess for him/her and their family. Given a choice to pay high rentals or owning a house, almost everyone would choose the latter. The reason is very clear, the sky rocketing rental prices that exists in all regions across India, provokes one to buy a house for themselves instead. Another reason that has given rise to ‘own house’ demands is availability of easy housing loan options provided by NBFCs and Banks. Here are few tips that will help you to go for the down payment with ease. Early planning to purchase a house can come with fewer responsibilities at an early stage of life as compared when there is grown family size and grown responsibilities. Look for Housing Loans from loanbaba.com or soft loan i.e. funding from known and family members as this can give you an advantage of not paying any interest on the loan and the trust which comes inbuilt. Start saving. Yes savings help you to channelize the money in buying assets that can give you financial relief. If you can pay more as down payment, you can take for a lower loan amount.